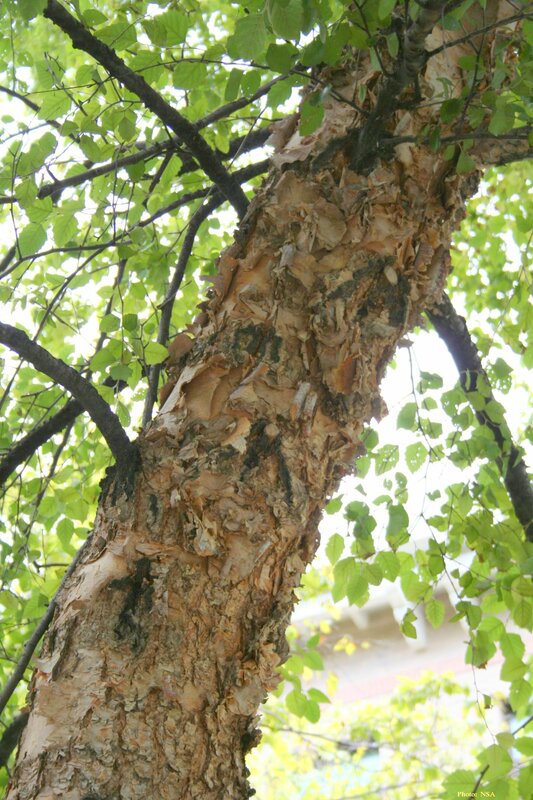 River birch is a fast-growing, medium-sized tree native to much of the east and southeast US and best known for its exfoliating, salmon-colored bark. It is frequently used as a landscape tree in eastern Nebraska. Most birch species do not grow well in the Midwest and Great Plains, preferring more northerly locations where summers are cool and moisture is more consistent. 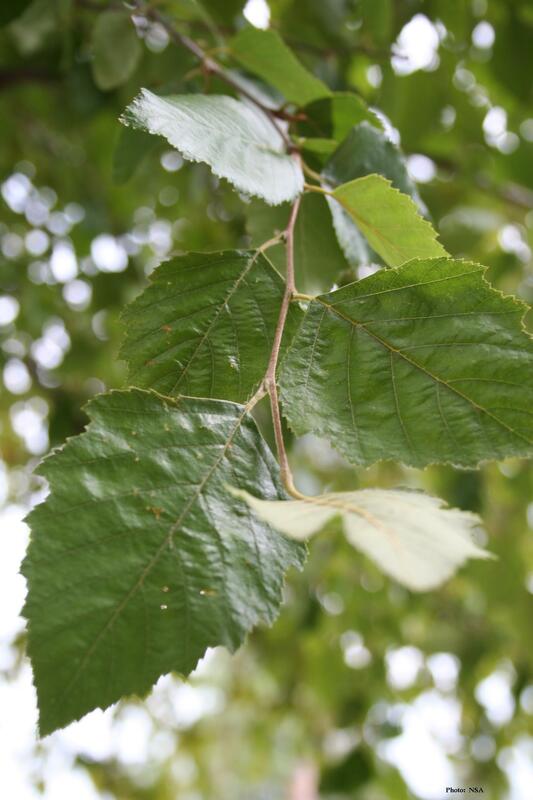 River birch, however, is the most heat-tolerant of birches and can grow quickly when well-sited in our region. It prefers moist, acidic, fertile soils but also tolerates drier sites when established. It adapts fairly well to heavy clay soils and will tolerate poor drainage. It is best used in specimen or small group plantings, in particular for wet soils along ponds and streams. Its aggressively-descending branches can quickly engulf a space, so it should be given room to grow and should not be planted near the front door or picture window. Suitable to plant in the eastern half of Nebraska. River birch is a deciduous medium to large-sized native tree. The leaves are alternate, double serrated, wedge-shaped, and sharply pointed. The flowers are unisexual, borne in separate male and female catkins on the same tree. The bark is light brown to buff, paperlike; exfoliating on young trees, turning to scaly bark on older trees. Positive attributes include its peeling, cinnamon-brown bark; its graceful, pendulous habit; its tolerance of lawn irrigation, and its yellow fall color. Its young twigs, buds, and foliage are browsed by white-tailed deer; seeds are eaten by grouse, turkeys, small birds, and rodents. Its spring ripening makes it particularly valuable. Goldfinch enjoys the mature seed in the fall. In Nebraska, river birch can be chlorotic (yellow) on high pH soils and a soil test should be done before planting. Although the tree is heat tolerant, it will benefit from a cool and consistently moist root system. Mulch and shade tolerant understory plants will help shade the ground and keep the soil cooler. River birch is commonly used in foundation plantings of new homes. However, they can quickly engulf these spaces becoming larger than anticipated. The tree will “bleed” heavily if pruned in spring when the sap is running. River birch is prone to ice storm damage as it matures. As a member of the Birch Family, it is related to the Alders, Hornbeams, Filberts, and Hophornbeams, in addition to other Birches. River birch bears an average of 375,000 seeds per pound. Water birch (Betula occidentalis) is a small western US native that also grows along streams in the Pine Ridge of northwest Nebraska. It’s an attractive, small, multi-stem tree with reddish brown bark, growing up to 20’ tall and wide, and a good choice as an ornamental for western Nebraska. Sweet birch (Betula lenta) is a medium-sized northeast US native with shiny red-brown bark and serrated leaves that turn a nice yellow in the fall. It has a rounded shape and will grow 30 to 40’ tall. It is resistant to bronze birch borer and has been used with success in eastern Nebraska when planted on favorable sites. Its twigs have a strong wintergreen fragrance when scraped and were used in the past for production of wintergreen oil. Paper birch (Betula papyrifera) is a short-lived, primarily Canadian species that exists as an ice age relic along the Niobrara River valley in northern Nebraska. It is named for its white bark that peels in papery strips on young trunks. The recent shift to a warmer, drier climate is accelerating the demise of this tree and it could disappear from Nebraska in the coming decades. It can be grown successfully in the landscape when its root system is kept moist and cool. 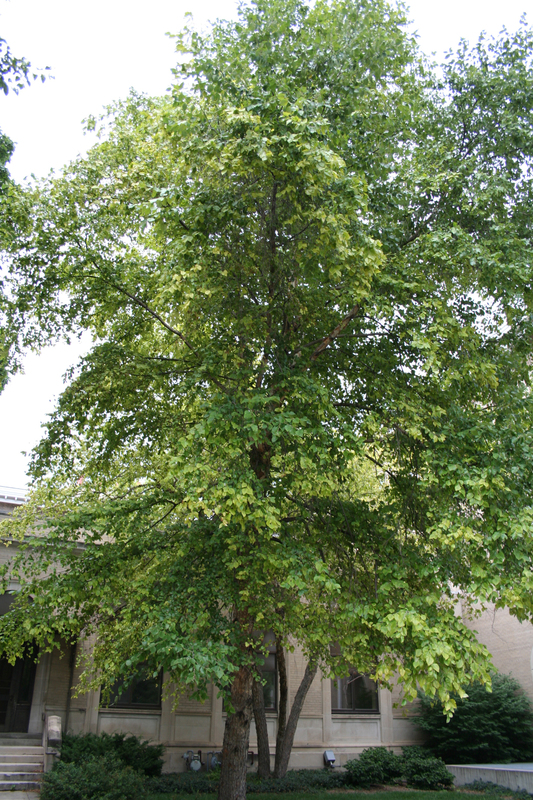 However, it is never a long-lived tree and is prone to attack by bronze birch borer when stressed. European birch (Betula pendula) with its attractive white bark and graceful weeping habit was a very popular landscape tree across much of Nebraska, especially in western and northern communities. However, the tree proved to be short-lived, succumbing to stresses of our unpredictable climate and associated attacks from the bronze birch borer. Though specimens can still be found in the state, this species is no longer recommended for planting.